Enjoy a bike ride through the street of Sakura, the pioneer of the Edo period! A medical school founded in 1843 where treatment by Western medicine and medical education were conducted. A house in which Hotta Masatomo, the local lord of Sakura lived after moving from Tokyo during the Meiji Restoration. Works of the people associated with Sakura and Boso area as well as the overseas art mainly from Holland. 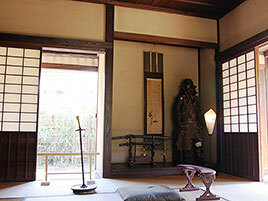 Feel how samurai lived in the Edo period Houses of three samurais who served the Sakura domain are open to public. Furniture and household items are on exhibit to give a glimpse of the lifestyle at the time. Castle park that extends on the grounds of old Sakura Castle. Museum with one of the finest collections in Japan The only national museum in Japan with the word “history”in its name. As its name implies, the museum features a collection of numerous national treasures amidst one of the finest exhibits in Japan on the history of Japan.